Bridal Veil Falls is a great place to visit while in Oregon near the Columbia River Gorge. Bridal Veil Falls State Park provides you the opportunity to experience being behind the waterfall. 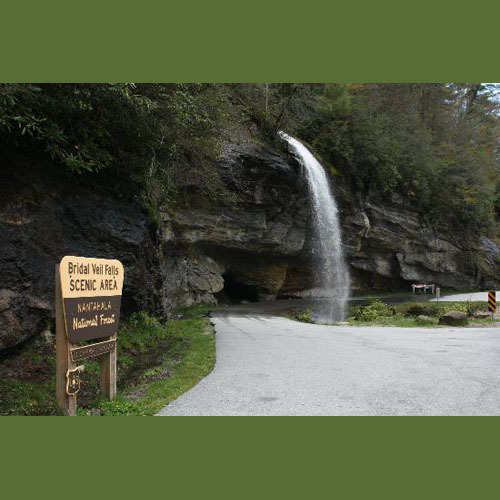 This beautiful State Park has some ADA accessible hiking trails, restrooms and exhibitor information. Also provided at this park, but not ADA accessible are viewpoints and picnicking areas. There are two parts to Bridal Veil Falls State Park, upper and lower, both should be experience at some point in time. Learn more about visiting the upper and lower trails of Bridal Veil Falls below. The upper trail takes visitors around the precipice of the cliffs of the Gorge. Sign boards along the trail point out distinctive native wild plants that grow abundantly in this area such as camas, lupine, bead lilly, trillium and bleeding heart. The trail is fenced beautifully with logged beams and wire to protect visitors along the viewpoint while maximizing every vantage point of the magnificent view of the Gorge. The famous geologic edifice known as the Pillars of Hercules, a 120-foot basalt tower once used as a training site for mountain climbing, can be seen best from the upper trail at Bridal Veil. The lower trail at Bridal Veil takes the visitor downhill to the base of Bridal Veil Falls and is about a mile round trip to the falls and back. Although short, this is a steep little trail full of switchbacks and is not wheelchair accessible. Along the way are a few unwanted wild plants of this area -- such as poison oak -- so keep on the path. Do not attempt to walk along the bridge over the Historic Highway to view the falls. The road here is a narrow two-lane passage with absolutely no sidewalk. PLEASE view the falls from the trail.